I hadn’t set foot in this stunning central Auckland city landmark for a good twenty something years. as a kid I would save my pocket money and mow a few lawns, to raise enough to jump on a bus and go spend a day in bustling Auckland city. wandering around from second hand record store to second hand record store flipping through the vinyl’s, then grabbing a lunch down in a dingy hidden away basement cafe I liked, before heading to Spaceworld; a loud and perpetually buzzing video gaming arcade in the basement of the mighty St James complex which housed three movie theatres above; the St James, The Regent and The Odeon. My parents took me to a live show of Snow White and the Seven Dwarves there and its the theatre I stood in serpent-like ticket lines outside on Queen Street multiple times, to see repeat screenings of the first three Star Wars movies. The St James theatre was designed by Architect Henry Eli White to replace the Fullers Opera house that had burnt down in 1926, and according to Heritage New Zealand, is one of the best-preserved vaudeville theatres in New Zealand. It has a lot of the original and rare elements in its interior that you just don’t see in modern theatres. Cinema projectors were added a year later due to the growing popularity of movies. The adjoining Regent theatre was added in 1982. The theatre complex has been closed for some time and is about to be renovated into apartments, a retail complex and car park. Since its closure in 2007 due to fire damage, there has been limited access to the theatre. It reopened briefly in April of 2015 for a couple of events before closeing doors again in July 2015 as a result of yet another fire. Since its original closure date, I have been trying to get into the place to explore and photo document. 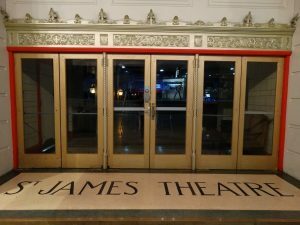 Every theatre seems to have its ghost stories and the St James and its conjoined relatives are no exception. Like the looming Civic Theatre right across the road, the St James too, has entertained many a spiritual patron in its time. We were lucky enough to gain two sessions of research time in the buildings; Sat 22 August 2015, and again on Fri 18 September 2015. The first being primarily for general exploration and photographic documentation of the location, the second being more indepth and focussed. · Session One: Karen, Mark, Matthew, Lisa, Sam and Barbara. At the time we arrived, we could no longer get into the Odeon Theatre as it had already been completely demolished. Due to safety restrictions, we could only poke our heads through a security door to see what was left and snap off a few photos. Sadly, everything had been dismantled and removed, leaving only timber and a large pile of rubble and building debris in what was the centre of the theatre. At the beginning it was overcast and cool, then it rained heavily a couple of hours into the investigation. The rain could be heard in our audio recordings. The second session was fine but cloudy. For both investigations the moon was in the first quarter. Session One : Temperatures ranged between 9 and 13 degrees depending on where we were in the theatre. There were no large temperature fluctuations despite at times it feeling as if the temperature had dropped significantly. Session Two: The temperatures ranged between 12 and 16 degrees in the building with no major fluctuations noted. Sam – They were mixed feelings really. The St James theatre was a semi -regular stomping ground for me in my teenage years seeing both local and international bands playing there. Being there certainly brought back some fond memories and it was certainly more familiar to me compared to other investigations I’ve been on where they have been my first ever visit to that particular building. I would say for the most part of it my first impression was a positive one – not unlike seeing an old friend for the first time; some things have changed, but the best parts have remained the same. Seeing the intricate details on the ceilings and pillars, the statues, busts and cherubs that adorned the walls, grinning down at us in much the same way as they had done to many other guests through the decades. It was an honour and a privilege to have the opportunity to take a look around. 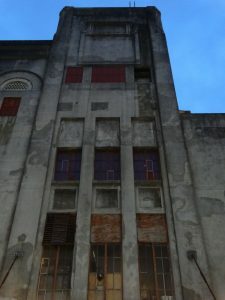 Seeing the posters on the walls backstage and seeing some of the graffiti on the walls (from the performers) – like an unintentional open time capsule, makes you appreciate what an important piece of Auckland’s history the building actually is. On the flipside it was quite sad to see that since its closure to the public in 2007 due to fire damage; a cocktail of time, neglect and uninvited guests have spoilt some of the areas to the point of needing some serious restoration and sadly letting it take on more of the stereotypical “abandoned building look”. I guess I was shocked more than anything standing in the same spot that I had not that many years ago, knowing how lively it was back then and coming to realise how quickly a building can deteriorate in the absence of a little TLC. Barbara – The actual theatre and stage areas were really smoky and smelt of BBQ. I had heard there had been a fire there so expected to see some fire damage so was pleasantly surprised that there was very little damage and there was only a little discolouration on the ceiling in the main theatre. The building was like a labyrinth with stair cases and stairwells going to seating, boxes, towers, dressing rooms and corridors and even a boarded off tower. There was no power in most of the building and some of the areas were already under renovation. I found the stairs, dark rooms and corridors quite disorientating and kept getting lost. For our first visit to the Regent, it was so dark that we couldn’t see our hands in front of our faces. When we turned our torches on we could see that the air was thick with dust. The front half of the theatre had had the cinema-style seats removed but the seats from about half way remained. It was quite sad to see that a lot of progress had been made on the renovation of this area. This time there were holes in one wall and we could see the room adjacent had many windows (some of which were broken). More seats had been removed so there were only a few rows at the back. The projection/lighting box at the back of the theatre had started to be removed and the front had been smashed. As a result the theatre was no longer the pitch black room that it had been on our earlier visit. 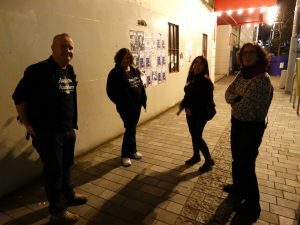 The Haunted Auckland team was joined by Midnight Paranormal for the return visit to the St James/ Regent / Odeon Theatres. Both teams were keen to investigate claims that there had been several deaths at the theatre and had heard a rumour that a recent fire at the theatre may have been caused by an alleged ghost. Upon arrival the teams initially took photos and video of the building and established areas of interest. Several group communication sessions were attempted. One of these sessions was held in a stairwell and was in response to EMF activity. During this session (which was attended by two people from both teams) we had camera malfunctions reported and EMF confirmation that there was some form of energy present where earlier there had been none. Unfortunately a lot of the audio from this investigation was contaminated due to a group of people who, along with their dog, were camping in the doorway of the theatre. Over the course of the evenings the team took hundreds of photos, and many hours of video, infra-red, and audio recordings. Joshua – First impressions of the building while we assembled at the rear entrance was how much city noise there was about and how that may affect our chances of clear audio or even when sitting getting a feel of the place the city noise could play a large part also a few broken and open windows that would let noise but also air flow into the building. I doubted any surrounding lighting from the city would be a problem though. Upon entering the foyer Mark went for a walk around with the key holder and others went straight to the theatre /stage area I remained in the foyer for awhile to get a feel for the area and did not sense anything out of the ordinary and city noise seemed not to be a problem .The seating area in the St James had been cleared for renovations but the stage area seemed to be intact and un touched .No feelings of anything unusual at this stage but I was drawn to the under stage dressing rooms and made a mental note to explore there later for photos and perhaps an EVP session. Was big and rambling, but I managed to cover all of the areas of the theatre that we were allowed to visit. · The theatre itself consisted of what would have been the lower circle, the mid circle, the upper circle and the stage. The stage had a large door leading onto the street. The stage was still rigged up curtains, lighting and props, e.g. hat stands, piano etc. At one end of the stage was a spiral staircase – at the top was a door leading to the corridor to the regent. 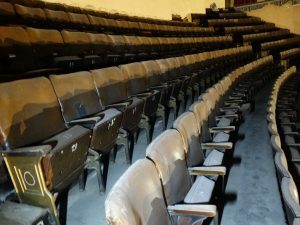 · The mid and upper circle still had the original seating which was pretty dusty and dirty. Roof rafters and floor boards were rotting. The queens’ boxes were still intact, though neglected like everything in there. · The foyer area had the beautiful period café and also held items such as a carved chair which the queen had sat on once. · There were 2 stairwells, the first leading to the mid circle and the other leading to the upper circle. 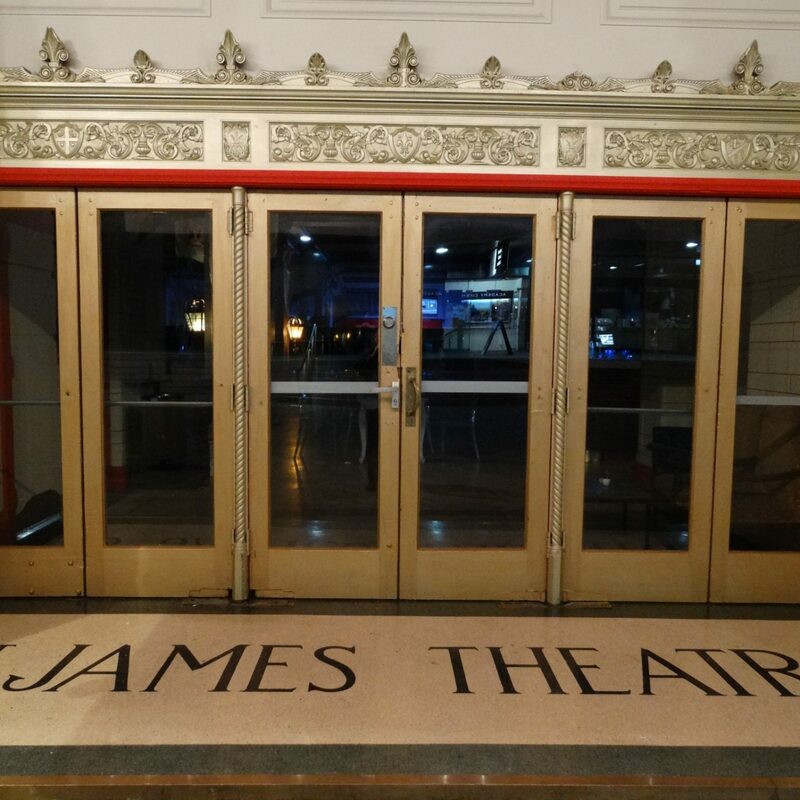 · The floor areas outside of the circles were filled with theatre props. On the middle floor had there was bar at one end and at the other end was a door which led to a series of corridors and stairs. One set of stairs led to the roof space. Up here you could see various see buildings in the city. There were a number of very run down rooms off the stairwell, many of which had old posters on the walls. Everything was pretty derelict. One set of stairs here led to the projector room for the Regent. · On the top floor, there were toilets to the right of the stair well, other than that, the floor was just filled with junk. · Off the café there was stairs going down to an old basement area (apparently used as barracks during the war. There were various rooms and corridors here. Some rooms were packed with old seats and chair parts. 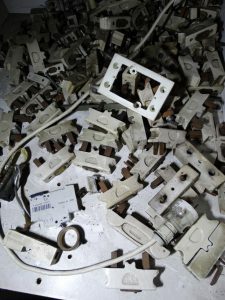 In another area was a computer graveyard – so the room was filled with hard drives and old style monitors. One corridor seemed to lead to a door that was possibly a flat? The wall here had a range of interesting tiles. The regent was mainly one big room with cinema seating and with a large stage at one end. · In the middle of the room was a staircase that led down to the toilets. 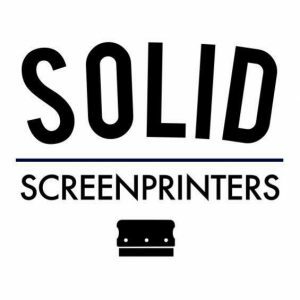 · At the back of the room was a separate projector room – this only seemed to be accessible from within St James Theatre. 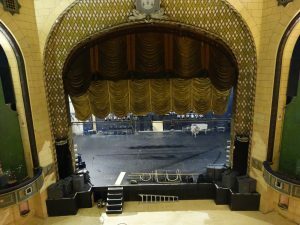 · I went onto the stage and then down the staircase at the back which led to the corridor which in turn led to St James Theatre. Sam – I guess this is actually what I underestimated, how big the place was. Of course I was aware of the theatre, the stage and the two levels above the theatre worth of seating, however I didn’t expect a chance to check out the basement, private theatre, projection room, film safe all to name a few of the rooms that made up what could easily be described as quite “labyrinthine” when put into perspective. There was more than one occasion where we had lost our bearings and had no idea of where we were going or where we had been only to discover that we’d gone in circles. This very reason was also to blame for a mysterious light seen by Barbara and Karen who were (at the time) sitting in the Regent theatre (*without a torch the Regent theatre was pitch black, so any light other than your own in that part of the building would spark interest). 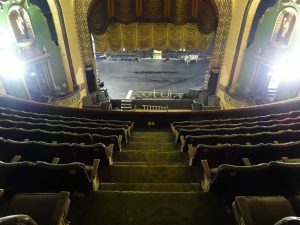 As no other team members claimed to be in the Regent theatre at the time and due to there being no power to that part of the building it raised the question of where the light was coming from. As it turned out, it was the rest of the team that were responsible, as the discovered that the route to the film safe and the roof of the St James theatre meant passing the door to the projection room of the Regent theatre, the light from our torches obviously reflected against the glass of the projection window creating the light in which Barbara and Karen had been seeing. Barbara – The building was like a labyrinth to me. There was the actual theatre and stage area with a set of narrow spiral stairs backstage that went to dressing rooms, corridors and the Regent Theatre. The main auditorium had three tiers of seating plus boxes with elaborate lighting and ornate plasterwork decoration. There was a foyer/cafe with a art deco style tiled floor had doors had doors which opened into the theatre, and on the other side a marble staircase lead to the upstairs seating areas, along with what was probably bars and service areas. From the foyer there were corridors, and concrete stairwells leading to outside doors, offices and an old tower (which had been boarded up). It was interesting to note the elaborate décor and statuettes that were common in theatres in years past. Regent – The theatre was set out over two floors. The largest area was the actual theatre, which was large with a projection box at the rear and a small stage at the front. Behind the stage was a hallway/green room which lead back to the St James theatre via spiral stairs. In the centre of the main theatre were wide carpeted stairs which lead down to a large room which had toilets, service cupboards and what was possibly a shop of bar. Another set of stairs then lead down off this room to the exit/entrance for the theatre. There was a wooden door leant up against the hole where the original door to the theatre would have been. For session two, after more work on renovations, the basic layout of the theatre was intact with the stage, seating area (with only a few seats left at the rear of the room), projection/lighting box, downstairs bar/service area/ toilets all still being there. There had been a lot of work done however since our first visit and one wall of the theatre had had several large holes made in it and a lot more of the seating had been removed. The hole where the original door had been had been boarded up and no longer had the door leaning over it. For the second session, the building had changed slightly as we no longer had access to some areas (presumably due to progress being made with the renovations). It was disappointing that the tower area and adjoining rooms and corridors were no longer available to us to investigate. Lisa – St James: I was impressed by the original features. I thought the café area was really beautiful and really well restored; otherwise the place was very run down, dirty and neglected. You could see that in its day it would have been a very impressive and beautiful building. There were a couple of places that I felt were a bit creepy. One was the stairwell going to the upper circle. Not sure if it was just in my mind, but I felt a bit uncomfortable here and went up and down the stairwell as fast as possible! Also at the top of the stairs in the large area before going into the upper circle – I felt uncomfortable here and found I really just didn’t want to explore that area; I just couldn’t make myself do it. 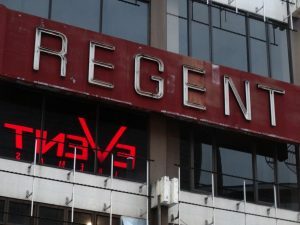 Regent : Hated it, old, dirty, dusty, empty, dark and creepy. It had a very 70’s feel. I didn’t really like the Regent at all and didn’t enjoy being in there. It was intensely dark when all the lights were out. I actually started feeling a little claustrophobic in the complete darkness at the end of the night during the communication session and at one point I had to fight the urge to just run out of there. We were told a story of a man having been set fire to in the toilets and subsequently died. The toilets were in the middle of the room down some stairs. I believe this may not have been the true story and the event actually happened at a different location. I explored the theatre and took some photos. The projector room was at the back of the theatre. I did access this, but from within St James theatre. At the other end of the theatre was a stage from which a back staircase led back to the corridor. Barbara – The theatre felt really creepy. It was very dark as there were no windows or doors which lead to outside. There was a thick coating of dust over every surface and lots of dust in the air. The person who initially showed us through the premises had told us that he hated being in this theatre alone and I could see why. At one stage in felt as if someone was standing right beside me and when we went downstairs the air felt really thick and to me it seemed as if there was may have been someone down there. I wasn’t sure if there was actually a living person or people there as we had been told that it was impossible to keep street people out of the building. I was nervous of stumbling across a street person asleep in the pitch black and this feeling was not helped by us hearing random bangs occasionally. For session two, the theatre had a completely different feel to it. Maybe it was due to the holes in the wall, which now let in light and air or the fact that this time we had a lot more people with us (including lighting and sound specialists). As a result instead of sitting in the complete pitch black while attempting communication sessions I was sitting in a lit room with a sound person recording my every word and it definitely altered the feel of the room. The bangs and odd sounds were not there the second time around either and we could clearly hear people talking outside the building. Barbara – We did have an experience while in the stairwell. The group had been upstairs doing a communication session and we were all going back downstairs via the concrete stairwell. We got to an area where there was a small wooden box tied to the handrail on the landing at the bottom of the stairs and most of the group had just gone through the door. 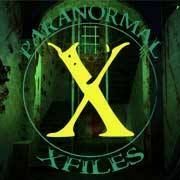 Carolyn and I stopped to discuss the origin on the box and Joshua and Hinemoa from Midnight Paranormal joined us. We had been standing there for a minute or so when my EMF meter went off indicating a strong electromagnetic field was present. (We had been up and down this stairwell several times already during the investigation and there had been no indication at all from the EMF meter). The energy level was constant so we asked for any spirit present to move away from the meter. Seemingly in response to that request the meter stopped. When asked if whatever was there could come back to the meter the meter went off again. We were able to continue like that for a couple of minutes. With my meter going back to 0 when I asked if whatever was setting off to move away and beeping and showing high levels when asked to return to me. Joshua also had a meter with him (different brand) but his showed no indication of any EMF activity at all. (It should be noted however that Josh’s EMF meter showed no response anywhere in the theatre that night other than a brief reaction of a few seconds). After remaining in the stairwell for about 15 minutes it became apparent that we had done all we could so we moved out of the stairwell, and went over the foyer and into the main theatre to where the rest of the team was. The EMF activity continued sporadically while we moved to this area and then stopped. While we were explaining to the rest of the team what had occurred I saw a movement over the other side of the theatre. It looked like a solid white elongated wisp of about 20 to 30 cms wide and approx a meter high (although it did not reach the ground so appeared to be floating). It moved at walking speed in front of a black speaker box. I saw it clearly as I was looking straight at it and it moved about half a meter before it disappeared. I then remained in the theatre and once again had a strong indication from my meter while standing in the middle of the room. I thought that maybe it was due to the lights overhead but the actual lights did not emit any EMF at all. I stayed and tried to interact with the possible spirit but eventually after about five minutes the activity ceased. I went over the area again trying to find any readings but was unable to. I repeated this about an hour later and was still unable to get any response from my meter. Later I also returned to the place in the stairwell where we had experienced high levels but there was once again no reading at all. While in the upstairs bar area I had a strong feeling that someone was there. Initially it felt as if they were right next to me but by the time we set up a group communication session I feel it was gone (or had moved right away from the group). It felt like it came back while Carolyn and I did a small communication session but there was nothing caught on my audio. Joshua – We went through into the Regent which was heavily under deconstruction and the air was thick with dust and it was difficult for me to breathe and got into my eyes , I suffer from bad sinus and hay fever so this was usual for me in such conditions others did not seem affected by it .Although very dark and tricky underfoot in places I did not feel anything untoward in that area at all. We all split up a bit to wander about and I really tried to get a spiritual feel for the place .while also observing how the others went about there work .It was decided that Eddie and his girls film Barbara perform an EVP session behind the bar , I stood at the far end observing .While the session was going I did notice at my end of the bar there was an open door leading to the rafters behind the bar and there was a lot of street noise funneling through the gaps and thought this may interfere with the audio and give background noise that could be misinterpreted as paranormal. Mark led the whole group around for a look through and we went to the next floor. While we headed past the bar area toward the balcony seating I noticed that Carolyn had stopped at the doorway behind the bar so I stopped to have a look also but I felt the need to enter and she followed at about half way I turned to say I had just gotten a cold feeling on my legs but a hot rush to my body and head but as I did Carolyn said ”I feel really hot all of a sudden”. There did seem to be a negative feeling at this stage and after describing it to others it was thought perhaps an EVP should be done there. I began looking around the main area and any rooms off to the sides and noticed some open windows that were letting in quite a breeze and it was tricky to get base temperature readings around that area. We continued our tour and I felt nothing out of the ordinary . Barbara – My EMF meter was very quiet for most of the first investigation. There was an area in the theatre (about half way up the stairs) when there was strong EMF for about five minutes then it all went quiet again. Even once I returned to the area a couple of times over the next two hours there was no longer any reading there. While the reading was high I had a strong feeling that someone was standing beside me and physically felt an energy. For session two, I had a similar experience with my EMF meter to last time. I had been over this area looking for baseline readings when we first got to the theatre and had walked past the area with my meter on several times in the course of the investigation. Then as I went past it again (for the third time in about 45 mins) the meter went off showing high levels. It was in the same spot that I had experienced the same thing during the last investigation and the energy would come and go, ie there would be high EMF for about 20 seconds then nothing for a minute then high levels for a few seconds, then nothing for a few seconds. It went on like this for about 10 minutes and then stopped completely. Joshua – Later in the night as some of us were walking down the central stairs Barbara had an activation on her EM meter and stopped at that spot with Carolyn and Hinemoa and I was last and still descending toward them. Barbara moved the meter around to see where the activation was originating and it appeared to be directly in front of her. I got my meter out to check the area by and surrounding her and did not get any activation at all through the whole thing. She began to ask questions and when asking for whatever it may have been, to stop and move away from the meter, the activation stopped. So she asked for it to activate it again, and it did. This happened several times. I then asked if it could activate mine and come to me but nothing occurred. While this was going on, Hinemoa was taking pictures but the camera malfunctioned and the shots became blurry at that time and remained so for the rest of the night but was working fine the following day. After we left that spot and they told the others what had occurred, I returned to the spot by myself with my second meter and I instantly got a short burst for about 3 seconds then nothing. I scanned the entire area for about 5 minutes and could find nothing electrical in the walls ceilings or floor or steps that may have caused the activations and my phone was off. While in the Regent where Eddie was filming Barbara performing another EVP I sat on the stage near Eddie and Hinemoa. After awhile, Hinemoa motioned to me that she heard a noise behind the stage in the walkway as we passed Eddie he said did you hear the thumping behind us .We went for a look and apart from it being away from the draughts and being a little hot spot, we saw and heard nothing else and nothing appeared in the photos I had taken. Hinemoa and I performed an EVP in the dressing rooms she thought she could hear knocking and I got a severe temperature drop in one particular area down there however all photos were clear and nothing on audio. I later determined the cold spot was more likely from a cool breeze coming through the stage door at street height funneling through the corridor and into the rooms. There were periods where I tried to sit still and quiet to try to pick up on any energies that may be around but did not sense anything negative or truly active. Sam – To be completely honest aside from a curtain that was flapping about by itself on the second floor, that turned out to be doing so because of air conditioning, a constant taping noise in the bar area that turned out to be a leak in the ceiling dripping on the carpet and the regular haze that clouded the back of the stage due to the neighbouring Korean BBQ – nothing gave me the impression that the St James theatre was haunted other than the fact that it was a historical building and it was also a theatre, both usually go hand in hand with ghost stories. I loved being up on the roof of the Theatre and seeing the film safe where all the film reels were kept for safety reasons being highly flammable. Being up there and seeing rows of what appeared to possibly be original spotlights and other lighting fixtures as well as old film tins (empty or not I’m not sure) simply left to sit there and rust away was quite sad really. It may be trash to most people but to me it was treasure – it’s a party of history even. There was another room right above the big St James theatre sign that can be seen from Queens St, however the only logical way of getting to it seemed to have been boarded off. I’d love to know what was in that room for curiosities sake. I definitely found the basement and the rooms joining it most intriguing. It’s a rare opportunity indeed to be below street level in Auckland City. It’s always been one of my fascinations with wanting to know what’s down there? Are the stories about tunnels running underneath Auckland city real? Are there tunnels that run from one building to the next? Well, on this occasion I can neither confirm or deny, but if not for some low hanging exposed wires there was certainly a hole in the wall that I would have liked to venture further into. Aside from that the basement was home to rooms that were stacked wall to wall with old cinema seats, dusty and obviously had been sitting there forgotten about for years. Another room on the other side of the basement seemed to be a PC graveyard, with piles of unwanted monitors and other computer parts stacked neatly along the walls. Seeing as most of my time here was spent exploring, mentally mapping the place out as well as taking photos I didn’t spend much time focussed on any room in particular in regards to experimenting with any EVP sessions or looking for unusual EMF spikes. Sadly I was unable to attend the second visit on the 18th of September, but if any other opportunities to return come along I would love to come back and do a full investigation. Barbara – There were no temperature fluctuations that could not be explained by windows or draughts. The buildings had holes and unsecured windows and the doors to the outside let lots of air in which caused draughts in and around the stairwells. There times that investigators felt cold spots and breezes but the thermometers did not corroborate these feelings. During the second visit we experienced a similar problem when trying to take temperatures. There were times when investigators reported feeling very cold but it was almost impossible to eliminate the possibility that the sensations were caused by breezes and cold air coming from outside. We had some EMF activity in the main theatre and heard some strange noises but I personally felt the room which was downstairs from the main theatre felt spookier. Karen reported that she had the sensation that her legs were shaking in this area. Karen and I both agreed that the theatre had a really creepy feel to it although the fact that it was pitch black probably contributed to this atmosphere. There was an area in the main theatre where my EMF meter went off and it really did feel like someone was standing beside me. It showed a strong reading for about five minutes then stopped. Even when I returned to the area several times afterwards there was no reading recorded. We also heard strange noises, which maybe sounded like chairs being moved on a hard floor and other bangs. Oddly, at one stage, my meter went off in the same area it had gone off last time we visited. Once again it seemed as if the energy would come and go. I walked over the area several times and then my meter went off when I was walking back (even though I had already been there several times during the investigation). The meter had a strong response for about a minute then stopped. Later in the investigation the same happened when I again returned to that area. Whatever was setting my meter off was not constant and seemed to come and go. While in the main theatre both Karen and I experienced cold spots and I felt very hot at times although the thermometer did not corroborate these temperature anomalies. There were draughts and cold spots but these were probably caused by cold air coming in from outside. There were a couple of times when I felt hot but these hotspots were not corroborated by my thermometer. 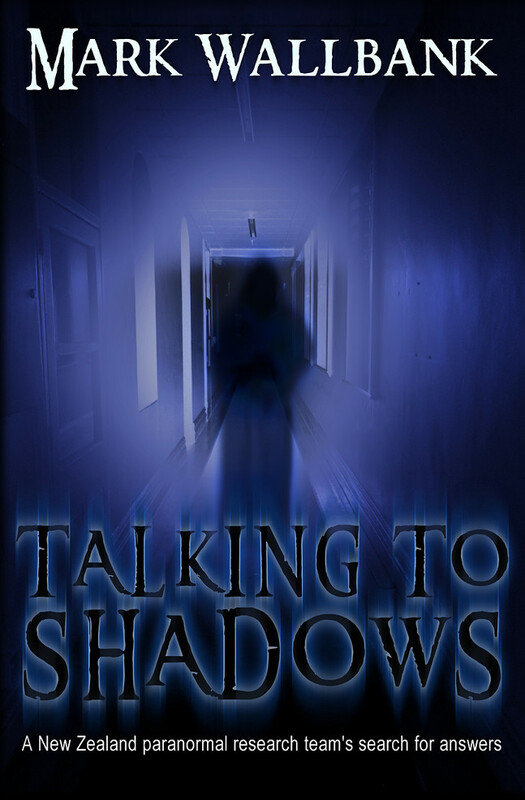 Members from Haunted Auckland and Midnight Paranormal reported feeling that there was “someone there” or a “creepy feeling” at different times and without speaking to each other. It is interesting to note that these areas were the same for both groups. EMF was checked at the time of the reports and there were no readings of significance at these times. It is interesting to note however, that later in the evening one of these areas had a lot of activity with the meter seemingly being manipulated by an energy. I would like to attempt to recreate the occurrence and monitor that area closely over a period of time before making judgement on whether the theatre is haunted. After the initial and follow up sessions, I don’t think that this theatre is haunted. I saw nothing that would indicate this and although I did hear several noises I feel that these could be explained by the fact that there are numerous eateries adjoining the theatre and that sounds from people outside could be clearly heard at times. There was some EMF activity, which I would like to follow up on but that alone is not enough for me to believe that the building has ghosts. Lisa – I don’t feel we detected anything of significance. Other than feeling uncomfortable in the Regent and a dislike of being in there, I really didn’t sense anything to suggest the area was haunted. I didnt see any indicators that there might be anything of a paranormal nature lingering around in the theatres. Although, we were only there for two sessions of four hours each. Not really enough time to really soak in the surroundings more comprehensively by data logging and monitoring every area. While the owners themselves weren’t aware of any specific spectral residents in their theatre and hadnt experienced anything first hand, they were aware that there have been a few eyewitness accounts through the years, though details are vague and lacking any real substance. 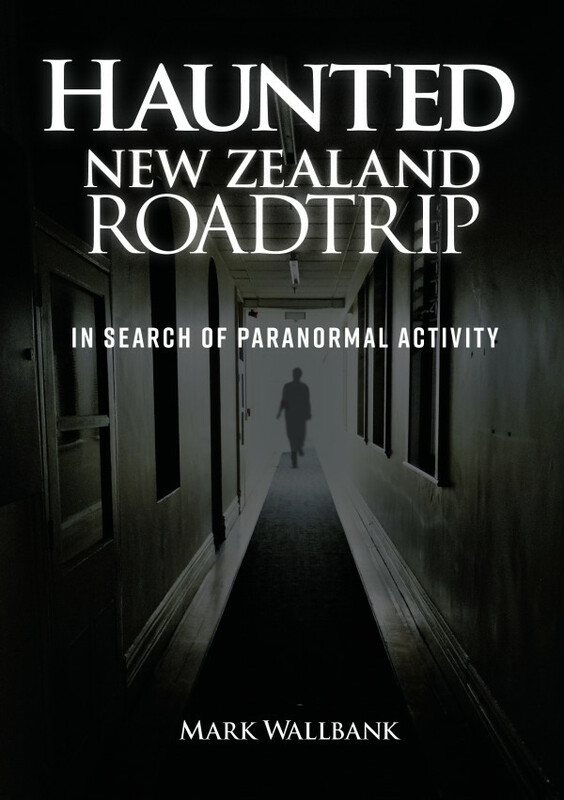 Haunted Auckland are also pleased to know we are apparently the only paranormal research team to ever be be given access to investigate these prolific buildings. For whats its worth, it was an honour and a priviledge to have been allowed such generous and trusting unaided access to these stunning and truely iconic Auckland landmark locations, before The Odeon and Regent Theatres were pulled down to make way for apartment construction, and the St James undergoes its major refurbishments to begin its new life..